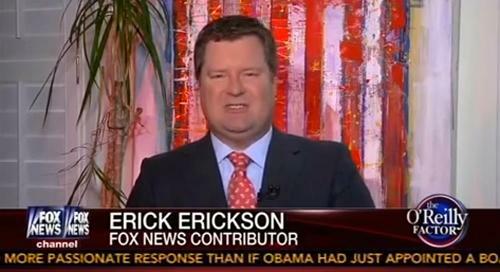 Erick Erickson: I'll Never Vote For Donald Trump - Joe.My.God. Donald Trump believes the federal government should fund Planned Parenthood. Donald Trump believes there are good things the child killers do. What is most damning is how so many are willing to be compromised by Donald Trump. For eight years the conservative movement compromised itself as a wing of George W. Bush’s Republican Party. The movement became ill defined and conservative became a synonym with Republican. Already we are seeing pastors and religious leaders compromising their integrity to vote for Donald Trump. Jerry Falwell, Jr. has joined the whores of Moloch, defending Trump’s Planned Parenthood statement on Twitter. Falwell presides over an institution that expels students who have abortions, but is willing to give positive lip service to Trump saying there are good things Planned Parenthood does. It is amazing how many television personalities have compromised their convictions for a discounted stay at Mara Lago. Donald Trump requires compromises of conviction that I in good conscience cannot and will not make. I have become convinced that Donald Trump’s pro-life conversion is a conversion of convenience. Life is the foremost cause in how I vote. Therefore I will not be voting for Donald Trump at all. Ever.